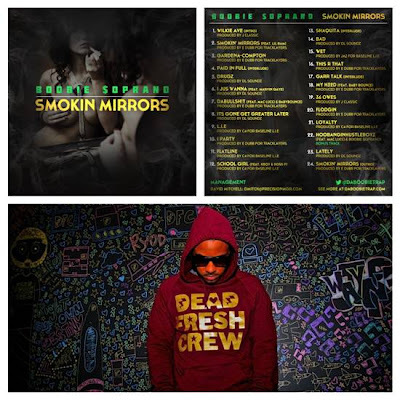 LOS ANGELES, CA (Dec. 20, 2012) -- Boobie $oprano, West Coast connoisseur and Mack 10’s Hoobangin Records’ youngest addition, releases the highly anticipated mixtape “Smokin’ Mirrors” dedicated to the streets. With the release of his three breakout singles “2012 Shiznit” featuring Glasses Malone, “L.I.E.” and most recently “Drugz,” Boobie $oprano has created quite a buzz in the industry. The eagerly anticipated mixtape is guaranteed to be a classic street banger. The self-proclaimed “Gardena’s Finest” proves he can hold his own after putting in years of ghostwriting and production experience behind the scenes. The explosive project featuring his clever word combinations over neck-banging beats, solidifies Boobie as an official rising rap star and one to watch. “Boobie has a flow and substance. Him coming from Gardena, I know it wasn’t easy. I’ve seen him put in the work over the years and it’s good to see that he’s starting to get his break. Coming this Thursday, I will be in Boston and will definitely be grabbing that mixtape while on the road. I can't wait to hear it because I know he is so Gaarrrrr!” says NBA star and family friend Brandon Jennings. As the youngest member of the Hoobangin Records family, Boobie brings a fresh take on a new generation of rap artists. The Gardena-native enlisted the talents of producers E-Dubb of the Tracklayers, DL Soundz and J Classic, with feature appearances by Glasses Malone and more of the West Coast’s finest fiya up and coming rappers including Mac Lucci, Baby Bounce, K Boy, Ross P, and Lil Bam. “Boobie has worked extremely hard for many years. He knew what he wanted to do regardless of his parents wanting him to take a different route in life. He followed his dream and devoted many years to bettering his craft. He pushed himself through the good and bad times and never gave up on what he wanted,” reveals Track & Field Olympic Gold medalist, Carmelita Jeter. Boobie $oprano’s former credits include a feature on gangsta rap supergroup Westside Connection’s second and final album “Terrorist Threats” – an album that soared to No. 3 on Billboard’s Top R&B/Hip Hop charts and remained at various positions in the Top 100 for 23 weeks. In addition to his work with Westside Connection, Boobie teamed up with Mack 10 on several projects, including “Mack 10 Presents Da Hood,” “Ghetto, Gutter & Gangsta” and “Hustla’s Handbook.” Boobie $oprano (credited as Young Soprano on the “The Hustla’s Handbook”) was featured on the hit record “The Testimony” that also made Mack 10′s Greatest Hits album. Keep up with Boobie $oprano online at www.DaBoobieTrap.com, on Twitter @daBOOBIETRAP and at Facebook.com/BoobieSoprano.